LA PLATA, Md. — Despite calls for her to be fired, a Prince George’s County Public Schools employee will get a fair chance to defend herself following a viral video from earlier this week, where she admits to calling a father the N-word in front of his children. The incident was recorded on cell phone video and posted to Facebook this past Monday. The woman who recorded it said it happened in a La Plata, Md. Walmart parking lot. RELATED: Parents, students share frustrations over decision to not close school in PG Co.
PGCPS interim chief executive officer released a new statement on Friday in response to a racist viral video that’s still drawing reactions. One of the loudest reaction voices, is coming from the woman who recorded that viral video. “She’s back with no repercussions,” said Dawn Tolson Hightower on Friday. Tolson Hightower said she’s outraged the woman has been reassigned from PGCPS. On Thursday, a PGCPS Spokesperson confirmed Sale has been resigned away from students. Sale has been removed from school grounds as the Labor Relations Office investigation continues. PGCPS Spokesperson John White said Sale has a right to share her side of the story. Hightower said she is not calling for the school employee to be fired, but she did call the school board and plans to do so again soon. Tolson Hightower posted the recorded confrontation to her Facebook page on Monday. In the video, Tolson Hightower, who posted under the name Dawn Nichelle Lennon, confronts a woman she says called her husband a racial slur. “Yeah, I did,” replied a woman social media helped identify as PGCPS Potomac Landing Elementary School employee, Darlene Sale. There’s a quick physical confrontation where you can see Sale’s hand rise towards Lennon’s cell phone as she passes. PGCPS confirmed the woman in Redskins gear is Darlene Sale. She’s identified as a media specialist on the Potomac Landing Elementary School’s website. PGCPS said Sale started with PGCPS in 2004. 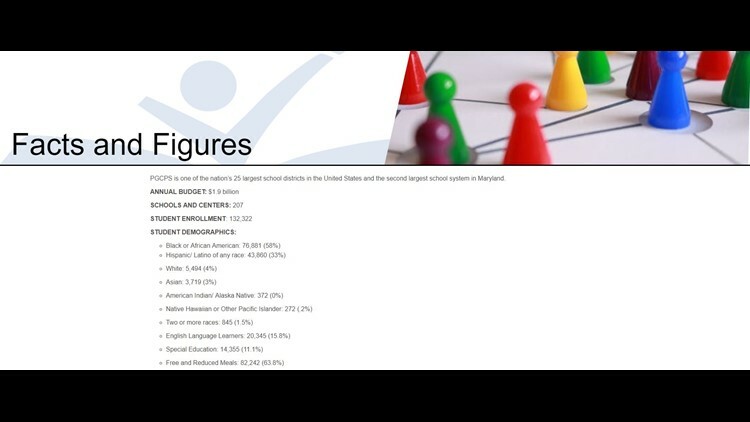 Online, PGCPS lists its student demographics as 58% Black or African American, 33 percent Hispanic/Latino, four percent White and three percent Asian. Earlier this week, a video was posted on social media of a Prince George’s County Public Schools (PGCPS) employee who seemingly admitted to using a racial slur during an encounter in a shopping center parking lot. Needless to say, I am disappointed and deeply disturbed by this behavior from a PGCPS employee. While there have been calls for me to take disciplinary action, current negotiated agreements with our union representing this employee limit my ability to address this situation directly. Additionally, there are other legal considerations. This employee, like all of us, is entitled to due process. In the interim, I have taken appropriate action to reassign the employee. Notwithstanding, let me be abundantly clear: Any employee who does not recognize, value and celebrate the value of our diversity has no place in our community of schools. Students of color comprise the overwhelming majority of our enrollment. We educate more students of color, send more students of color to college and employ more people of color than any other school system in Maryland. Diversity is the strength of Prince George’s County Public Schools. It is my hope that we will use this unfortunate situation to engage in meaningful dialogue to enhance our civility, respect and empathy. All of us share the responsibility of modeling these attributes for our students. And I demand it as Interim CEO of PGCPS.